PHILADELPHIA—A group of pro-Israel protesters made their presence known outside of a panel discussion on the "evolving politics of the Jewish community" put on by J Street, a radical advocacy group that is critical of the Jewish state. The Tuesday morning protest, which was organized by the Republican Jewish Coalition, aimed to tie J Street to the Democratic Party's presidential ticket, a task made easier since Hillary Clinton's announcement that Sen. Tim Kaine (D., Va.), a J Street-endorsed politician with extensive ties to the group, would be her running mate. Kaine was one of the senators that decided to boycott Israeli Prime Minister Benjamin Netanyahu’s speech to Congress in 2015. 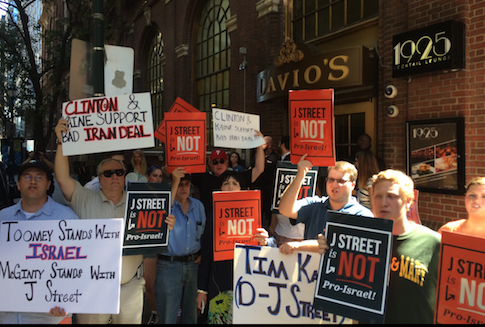 As attendees such as David Axelrod arrived at Davio's Steakhouse for the event they were greeted by signs that said Kaine is "bought and paid for by J Street" and pointed to Clinton's support of the Iranian nuclear deal, which is opposed by the RJC and the majority of pro-Israel groups. RJC spokesman Fred Brown told the Washington Free Beacon that "today's Democratic Party is bought and paid for by J Street and their anti-Israel policies" and said that "it's clear Democrats have moved far out of the mainstream for American Jewish voters." "With J Street's influence over the Democrats, it shouldn't surprise anyone DNC delegates were flying the Palestinian flag on the convention floor last night," said Brown, making reference to delegates that brought a flag into the Wells Fargo Center. The Washington Free Beacon reported that on Monday morning Rep. Hank Johnson (D., Ga.), a Clinton-supporting super delegate to the convention, compared Israelis to termites. Johnson, who has since apologized, has also been endorsed by J Street. This is nothing new for Democratic conventions. In 2012, the mention of Israel drew loud boos from the convention hall in Charlotte, North Carolina. This entry was posted in Politics and tagged 2016 Election, Democratic Party, Hillary Clinton, Israel, Tim Kaine. Bookmark the permalink.